I am in the midst of finalizing my first book. The story is about three generations of a Korean family – my family to be exact – but it’s really about fighting to hold onto one’s identity while navigating extreme cultural change, and finding who you are and where you belong. I invite you to join me on the journey as I complete the book and get it published. Along the way I’ll share stories about my family and insights into who I am as an author (and mother, daughter, wife, attorney, etc.!). Please enter your name and email address in the box at the right, and be the first to receive my new journey entries. My first book, Echoes Across Time, is a true-life story of those who have come before me, and those who have influenced and shaped my identity. It’s about a family – my family – but also about courage and resourcefulness in the face of tremendous political, economic and cultural change. This story helps readers put into perspective their own search for self and place in the world. My paternal grandmother and my father in Manchuria in 1943 during WWII and the Japanese Occupation. My parents, brothers and me taken in the mid-70’s after we settled into life in California. I think this photo is still on display in my parent’s home. 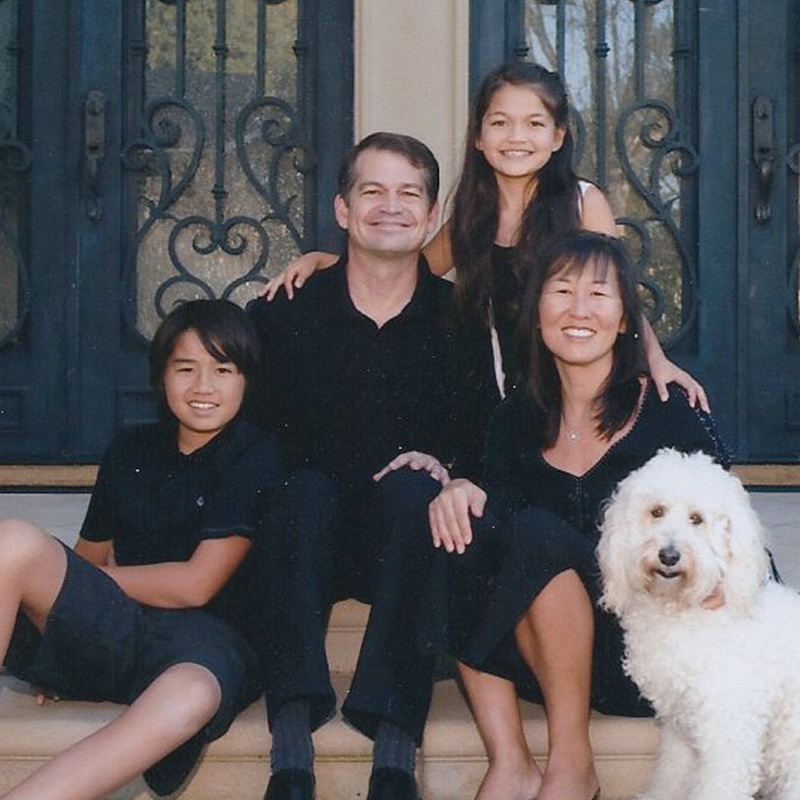 This is a recent family holiday card photo taken at our home outside of Los Angeles. Daisy is the star in her white coat! Join my mailing list so you can follow my progress as I bring the book from a manuscript to “real life” and share your thoughts about your own journey.